In my book, Ice Cream: A Global History (Reaktion Books/University of Chicago Press), you’ll take a trip through ice cream history that will tantalize and delight you. You’ll read about ancient Chinese Emperors who devoured a milky frozen dessert made with dragon eyeballs. You’ll learn how 18th century Italian and French chefs made exotic ice cream flavors like asparagus and eggplant. You’ll find out how Americans created the ice cream soda, the soda fountain, the sundae, the cone, the Good Humor bar and other fabulous treats. Together, these frozen delights took the world by storm. Recognizing a universal symbol of pleasure and fun, soda fountains were deployed as backdrops for Hollywood movies. And artists, like Picasso, used ice cream images in their works. So indulge in your favorite pastime, but without the calories! 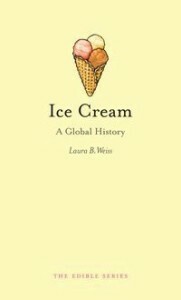 Click here to buy Ice Cream: A Global History.